Over the last 20 years, the way we work and collaborate has changed dramatically. The promises of a free agent nation from the early days of the internet have become a reality for freelancers and solo entrepreneurs around the planet. Effective teams still matter, though — maybe now more than ever. How those teams come together and execute on a common vision requires a different leadership mindset, and a more project-oriented approach compared with traditional concepts of employment. Today we’re speaking with Shane Snow, co-founder of Contently — a global talent network and outsourcing platform for the content creation industry. He’s also the author of the new book Dream Teams: Working Together Without Falling Apart, an examination of history, neuroscience, psychology, and business that explores what separates groups that simply get by together from those that get better together. Shane Snow: I am Shane Snow. I’m a journalist, the founder of a company called Contently, and a human explorer. And I am unemployable. Voiceover: Welcome to Unemployable. The show for people who can get a job, they’re just not inclined to take one – and that’s putting it gently. 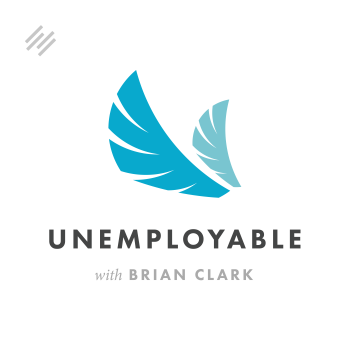 In addition to this podcast, thousands of freelancers and entrepreneurs get actionable advice and other valuable resources from the weekly Unemployable email newsletter. Join us by registering for our free Profit Pillars course, or choose to sign up for the newsletter only at no charge. Simply head over to Unemployable.com, and take your business and lifestyle to the next level. That’s Unemployable.com. Brian Clark:	Over the last 20 years, the way we work and collaborate has changed dramatically. Promises of a free agent nation from the early days of the Internet have become a reality for freelancers and solo entrepreneurs around the planet. Effective teams still matter though — maybe now more than ever. How those teams come together and execute on a common vision requires a different leadership mindset, and a more project-oriented approach compared with traditional concepts of employment. Today, we’re speaking with Shane Snow, co-founder of Contently — a global talent network and outsourcing platform for the content creation industry. He’s also the author of the new book Dream Teams: Working Together Without Falling Apart, an examination of history, neuroscience, psychology, and business that explores what separates groups that simply get by together from those that get better together. This episode of Unemployable is brought to you by the all new FreshBooks. Easy accounting software for freelancers, consultants, and anyone else who works with clients. You’ve simply got to try it for yourself and you can with this free, unrestricted, no obligation 30-day free trial. Just go to Freshbooks.com/unemployable. And don’t forget to enter Unemployable in the “How Did You Hear About Us?” section. Brian Clark: Shane, it’s been awhile. How are you? Shane Snow: Hey, I’m great. It has been a while. Brian Clark:	You’ve been busy. Shane Snow: We’ve all been busy. Shane Snow: Everyone listening to this has been busy, and grateful that they can hear us chat while being so busy. Yes, indeed. Brian Clark:	Yeah. Let’s give people a little bit of background. I think our audience might be more familiar with Contently than most general people. But let’s revisit that a while and really talk a little bit about right before Contently and how that all started up. Shane Snow: My background is in business and science journalism. Lately, I’ve been thinking a lot about this — why I chose what I chose to write about. My dad’s an engineer and I grew up taking things apart and putting them back together, and him teaching me about car engines and buildings and all of that. When I decided to become a journalist, that’s what I wanted to do. I wanted to look at science and human behavior and business, to kind of take things apart and put them back together and teach people about them. That’s what my training was in, but I was always an entrepreneur at heart and that goes along with that engineering thing. I put myself through school as a freelancer doing web design, doing graphic design, writing for magazines. When I came out of school, it turned out that most of my classmates coming out of this very expensive journalism program landed on the street as freelancers, because the world was changing. This was about 10 years ago now, nine years ago. The world was changing and journalism, in addition to a lot of creative fields, was starting to become this thing where, because of the Internet, you could hire people wherever in the world and you could access talents in ways that you couldn’t before, which created two things. An opportunity — people who wanted to be freelancers, who wanted to be independent could work and build their own lifestyle. But also a bunch of challenges, which was what I started looking at. All of these friends of mine who were amazing reporters, amazing editors, great photographers were terrible at being freelancers. Terrible might be a strong word, but they were bad at it. Because no matter how good you are at the craft, you also have to be good at getting clients, getting clients to pay you on time, managing your cash flow, doing your taxes as a small business owner, promoting yourself, building a website and a portfolio and all that. Contently was this thing that I sort of accidentally started as I was writing about business. I was writing about a lot of startup companies, tech companies, science companies. Basically, with a couple of friends, we started our own company to match freelancers with professional pedigrees with work. And we did this with data. Basically, for a journalist, we would slurp in all of your work that you’ve ever written, wherever it’s published on the Internet or you upload it, and then we’d automatically tag it, figure out what it’s about. We figure out what publications you write for, how well the stuff did on social media. Then, when clients come along, or when someone comes along and wants to hire a writer, they can say, “Well, I need someone in Alaska who writes about fishing and who’s written for major newspapers.” And aha! We have someone in our database that we can hook you up with for work. That was the original idea — this sort of marketplace for professional creative talent. It turned into very much a marketplace for creative talent for content marketing, which obviously a lot of the Copyblogger audience knows everything about. But our clients started becoming Pepsi® and American Express®. As that happened, these clients, these corporations wanted to hire journalists and editors or photographers for their blogs and for reports and research papers and things. They had a lot of money to pay, but they also had a lot more challenges than just finding someone with expertise in a certain location. Out of that marketplace, we built this platform for managing content marketing, which is sort of like a Basecamp, if you’re familiar with that or like a Salesforce, but for content marketing. Brian Clark:	You did the opposite of a trend we’re seeing now. Everyone wants to build a SaaS (or software as a service) and now they’re tacking on a software with a service. And you started off, I guess if this is correct, it was more of a service and then became slowly more software. Shane Snow: Yes. Actually, it sort of looped back around, sort of like pie I guess. On the top it looked like a service and then in the middle, it’s a software company. And on the bottom, there is now a service again, where the crust we put on the other side of the company is actually a strategy practice. Say Pepsi comes to us and they say, “We want to do content marketing. We don’t have any ideas. What should we do?” We have a strategy team that helps them figure that out and use this data and does all the research necessary. They put together a plan, then they use the software. Then, if they need some freelance services or some editors, then we hook them up with that too. How Did Your Business Change and Evolve? Brian Clark:	It’s funny, we see exactly the same thing, the same need in the market. You were responding to what you saw. That’s the way to do it. Shane Snow: Yeah, and it changed in a lot of ways that I didn’t anticipate. The thing I brought to the partnership — there were three of us: the tech guy, the business guy and then me. I was really big on the future of media, the future of work, the freelance gig economy and how brands were becoming publishers and all of that. That was really the focus that I had and the angle that I brought. As we grew and evolved, it really turned into this company that was very much about the future of marketing, the future of sales management and actually business software solutions, cloud software and stuff that was way outside of my wheelhouse, but very interesting. The word that I used early in our pre-interview is it felt like it metastasized in weird directions, which was a huge learning experience for me. But also when you’re building something like this and it starts working and you do follow that need and then respond to the market, you end up in places and exploring places that you didn’t think that you were going to end up, which has been fascinating. Brian Clark:	Yeah, it is fascinating. It’s interesting, because lately we’ve been, I don’t know, somewhat unintentionally exploring this theme. I think the general consensus about entrepreneurship in general is wrong, especially the way it’s portrayed in the media. I think people who listen to this show get it. If you’re a little earlier on in your career and you, as a freelancer or consultant or even if you’re in your first product or whatever, those days when you feel like, “I wish I could do something or maybe someday I’d like to do this,” that’s a completely normal feeling. Take it from example of tons of people. Just because something succeeds doesn’t mean you have to ride that out for the rest of your life. Shane Snow: Yeah. There are a couple of things there that come to mind for me. One is very much what you’re speaking to — this myth of this universal person who is both good at taking risks and being creative and creating new things and launching things, and also scaling that thing, and also running that thing when it’s huge. The person that can run a giant organization has very different problems to solve. It doesn’t have to be the same person that can start the thing that turns into that organization. There is this sort of weird, I don’t know, pride that we have or that people put on people. We celebrate these universal people that can do everything. But I actually have a lot of passion for a different kind of person. It’s fine to be that universal person if you can do it. But to me, I think there’s actually a benefit to splitting some of your time off to do different things and to having a little bit of creative or entrepreneurial ADD. What I mean by that is for years and years I’ve used my writing, my journalism side of me as a means to explore things. Even while I’m building this company, I’ve explored all sorts of different things about business and psychology and continue to write about those while running the company, spending some portion of my time doing that. I think that that’s one, helped me to not go crazy as things change and the company gets bigger. And two, it helped me to learn things or to draw analogies or bring things from outside of our industry into our industry. I think that gives you a bit of an advantage if you can jump around a little bit or you can explore different things versus being so focused in one lane, especially if what you’re trying to do is come up with novel solutions to problems, which often is the thing you want to do in the beginning of a product cycle or a company cycle. I think there’s a lot of value in sticking to that sort of mentality or that kind of habit, and partnering, building a team so that someone who does have a passion for systems and the scalability and running big complex things (if your business turns into that), then they can do that. That’s my role now. I’m sort of an advisor to that team. I’m at large at Contently. Other people who love that big systems thinking, they’re doing that. And I’m back to sort of exploring things and exploring fundamentals. And I think that’s okay. Brian Clark:	It’s more than okay. There are so many good points in everything you just said. I’m trying to keep track because it was solid. Brian Clark:	No, no, it’s good. It’s good to have a guest who throws that much value at you in one statement. The universal person — it’s a myth, I think. And those who think they are that person are usually wrong. I mean, I think even Elon Musk right now is unraveling, because he thought he could be the superman. You need to stick to what you’re good at, Elon, everyone. Brian Clark:	Let’s face it, he’s not a normal person anyway. I try not to encourage people to idolize people that are just freaks of nature to a certain degree. Not criticizing him, just saying he’s just wired differently. Brian Clark: The other thing, looking outside of your own little box, your industry, how things are done. Couldn’t you say that’s the foundation of true creativity? There are so many stories of how Henry Ford went to the meat packing plant and created car automation. Or the printing press was created when Gutenberg saw a wine press and had a flash of inspiration. Shane Snow: In my latest book, there’s an analogy that I draw in cartoon form in the very first chapter that I use throughout the book that speaks to this. The book is exploring, like a lot of my writing basically, how breakthroughs happen. It’s exploring how basically breakthrough teams work. This little cartoon diagram I use applies whether you’re an individual or a team. Basically, you can visualize every problem that you’re working on as a mountain range with different size mountain peaks. If you’re trying to solve a problem, you’re basically exploring the mountain range, trying to find the best thing. But in life and in this fictitious mountain range, you’re exploring through the fog. You don’t know what’s out there. You’re trying to find the best solution to a problem. But really what it is, is a bunch of people doing things the same way and not able to figure out how do you get to a taller mountain peak. Because you’ve got to climb down, you’ve got to go through some pain to try and explore more. This is where Henry Ford going to the meat packing plant or whatever, he’s going over to a different part of the mountain range to explore someone else solving a different problem. But in between that and whatever he was working on with locomotion was a new mountain peak that was even taller, a new way of approaching climbing the mountain. It’s probably a little bit difficult without seeing the metaphor. But the idea I hope that’s coming across is so often our success at doing something actually prevents us from seeing that there are better ways potentially out there, that the world has changed, and earthquakes happen. There’s a new mountain that we could climb. This is where a lot of people get stuck in a lot of industries — it has worked. You can’t be faulted for saying, “Well, this is how it works,” and yet that’s not how innovation happens. That’s how plateaus form. Brian Clark:	Speaking of innovation, our sponsor, FreshBooks knows a thing or two about that after they completely reinvented their platform. The new FreshBooks makes it ridiculously easy to handle your accounting. It’s completely transformed how freelancers and small business owners deal with their day-to-day paperwork. That’s because it’s been redesigned from the ground up and custom built for exactly the way you work. Get ready for the simplest way to be more productive, organized, and most importantly, get paid quickly. Now, there are tons of features that we can go through here, including easy invoicing, customizing your invoices, setting up online payment, deposits, proposals. It’s really feature-loaded and intuitive. The best thing to do is just try it out for yourself with this free trial. It’s unrestricted. You don’t have to give a credit card, and there’s no obligation after the initial 30 days. So give it a try yourself. Just go to Freshbooks.com/unemployable. Tell them Unemployable sent you when you’re there, and give it a shot for yourself. Brian Clark: I do want to talk more about the new book. Now, this is your second book. Smartcuts was successful and really good. A great rare combination. Brian Clark:	I know your general, let’s say, personality motif and what you like to explore, what interests you. But specifically, what was it that prompted you? Tell us what the title of the book is and what prompted you to explore this topic. Shane Snow: The title is Dream Teams: Working Together Without Falling Apart. It’s a business book in disguise. It’s really a book about human nature and kind of an adventure through history and science. What I wanted to explore is there were a few things that were happening in my life. One is I started this company eight years ago. A few years in, I saw my job had changed (and I think you could probably relate to this very well). My job had changed from someone who does things to someone who helps other people do things, and who picks the people to do the things, and who figures out who needs to be fired, and who agonizes over those kinds of things rather than doing a lot of the hands-on creative work, which is why I was writing on the side in the first place. I needed to be doing that. But I started getting hooked on lots of little mini-explorations that kept coming back to this idea that when groups of humans come together, they can do incredible things. That’s how we won planet earth. That’s how we built everything and built society. Even though we’re smaller than the saber-toothed tiger, we beat the saber-toothed tiger, because we could work together. We can make fire and cities and all that. I kept coming back to this idea that when different human beings come together, they can either create things — make music, make magic, build and invent — or most of the time, at this point, we slow each other down. The bigger the company, the slower it gets. The bigger the community and the country, the more feuds and problems we’ll potentially have. Often actually, when different humans come together, we break down. I wanted to explore this paradox in different contexts, whether it’s partners working on a business or a marriage or a band or a social movement or trying to get the whole world to change. When humans need to collaborate, what makes the difference between those rare teams that actually do add up to more than the sum of their parts like we were promised and most teams, which either slow down or breakdown? Part of that was because I wanted to figure out what’s the underlying psychology, and what are the underlying behaviors that I need to foster in my company, as my role is now team-shepherd and no longer creative-idea-guy. Part of that was just as I’ve gotten older, I’ve been thinking more and more about my role as part of the team of my neighborhood and my community. Even just looking at what’s happening in the world, there are a lot of divisions. It feels like we aren’t thinking of ourselves as team humanity as much as we should be. And we have a lot more ability to kill each other and wipe each other out than we did before when all that we had were sticks and rocks. So I was thinking about all of those things and I wanted to explore the science behind that question. Like I said, it was an excuse to explore something that could help my business as well. It was very fascinating, because there’s a lot of stuff about how we are taught to work together that doesn’t actually add up to breakthroughs or to progress. There were a lot of really great stories in history that I managed to find and really great studies that have changed the way that I live my life with my friends and my relationships as well. Anyway, I’m kind of monologuing at this point, but that’s what Dream Teams is about. Brian Clark:	Yeah, I think it’s a timely topic. You mentioned the reason why homo sapiens basically rule the planet is collaboration. A lot of people think differently, that it’s somehow these individuals who push society forward. Certainly, there have been examples of that. I think it was the book Sapiens that first laid that out. It’s collaboration that sets us apart in certain ways. Language as well. Although, I also read this great thing and I forget where it was, but the reason why ants are so efficient is because they can’t talk to each other and argue and have opinions and yet, we wouldn’t be quite what we are without it. Shane Snow: That’s funny. That’s one of the main concepts actually — that if you’re doing something routine, you actually want homogeneity. You want a lineup of ants following orders. But if you’re trying to solve some novel problem, what you actually want is cognitive friction. You want to make some arguments in different points of view. That’s uncomfortable, but that’s how progress happens. Brian Clark:	That’s the sticky part that the efficiency management doctrine hates. And yet, that’s why you become IBM. Not to brag on them necessarily, but it happens. You know, I’m writing about research that other people did. I have editors and fact checkers and sensitivity readers and friends and critics that are all pushing me to do better work. Even if I’m typing in isolation, there’s so much that goes into a piece of art or nonfiction. I think a lot of these people that we revere, like the Elon Musks, actually a great example. He is very much a product of, in many ways, his family and his opportunities that he was given. He’s a genius and there’s no question about that. But there are all these great stories about how in his first company – so his brother, Kimbal, is a big part of his success. Brian Clark:	Yeah, Kimbal’s here in Boulder and owns all the coolest restaurants. Shane Snow: So that guy, they would get into fistfights and wrestling matches in the office when they were in their 20’s building their first company. They could do that, because they were brothers. He had a brother who would push him, who he could push. They could have this sort of intense, intellectual battle. But also, at least the biographies say that Kimbal kind of pulled him off of the cliff. You see this dynamic all the time. One of my favorites in history is Alexander Hamilton in the Revolutionary War. He was very much this sort of hypomanic, charge into battle with no plan, no one behind you, just surprise the enemy or whatever, do all these sort of crazy rash things. He would have got himself killed if it weren’t for George Washington pulling him back. But George Washington got pulled along by Hamilton’s hypomania. We revere these people as individuals. But when you peel back, behind the scenes, the people that support them, the people that inspire them, people whose work they’ve been building on, it’s all a product of that collaboration. And it’s often the tension between our different ways of doing things where the energy comes from. Brian Clark:	Yeah. So, so true. Okay, let’s take the “Dream Team” concept and apply it to some of the aspirations of the audience that’s listening. We hear more and more, and we’ve covered this, the increase in one-person businesses that are doing substantial amounts of revenue, right? And it’s not really a person by themselves, they’re aided by technology certainly, but it’s this network of freelancers, consultants, outsource services, SaaS, all of this kind of stuff. There are people involved all around this one person and it’s not really them. In order to stay profitable, viable, growing, whatever the goal is for that person, they have to manage a sometimes complicated team, right? What principles would you share from your own research and your own experience, obviously with Contently, like you said, moving from the doer to the shepherd? What’s the best advice you can give people about managing people in a way that accomplishes your goals and keeps your sanity? Shane Snow: There are a few things and I’ll try and get them all out concisely. The first is you need to recognize that a group of people is only going to be as smart as the smartest person in that group if they think similarly. If you’re the solopreneur and you surround yourself with people who think like you, who remind you of your younger self, who have your same personality and ambitions and all that, there’s a very good chance that you will be limited by your own capacity. Whereas a group of people that think differently can become smarter, can see further than any one member of the group. A lot of big companies are limited by that sort of hero at the front. Steve Jobs is a really good example. Apple is still doing great, but Steve Jobs very much was the one who did the big thinking. It sort of came down to whether he saw it this way or whether he could be convinced to see it this way. And he certainly collaborated with a lot of people. But a company like that, with that sort of cultish obsession with the leader and the strength and the smarts of the leader, will be limited by that leader. So recognizing that if you want to be smarter than you, you need to surround yourself with people, whether they’re full-time or freelance or just people who come in and out of your life, to help you think differently. You need to surround yourself with people who see things differently than you do. And you need to invite that. I think especially inviting critics and naysayers and people from very far afield from the way you think. You don’t have to accept everything they say, but you need to listen and be curious. I think that’s the first starting point for the way you need to think about it. If you think that you’re the smartest ever and you just want to be a dictator and be in control and all that, fine, but just know you’re going to be limited by that. Why not be an open-minded dictator? So, that’s the first thing. The second thing I would say is we’ve been talking for many years, at Contently we’ve been talking about this a lot, and I know you’ve been talking about this a lot in your work — the gig economy, the freelance suffocation of the world. The metaphor or paradigm or whatever it is that I think is going to be the prevailing one in the future is something that’s slightly different than that. It’s a twist on that that speaks exactly to what you’re talking about with these kinds of businesses. It’s the Hollywood model. Shane Snow: The Hollywood model is you’re going to film a movie and you assemble a custom group of people, specialists who are experts at everything. You assemble them for this specific problem to be solved, the specific job to be done. You’re the director of the movie, you cast, you get crew. They don’t even have to have worked together before. The people who are taping down the lights and the people who are doing the costuming and scouting locations, they all know what they’re doing, and you collaborate with them really well. You’re assembling that group on the fly. Then when the movie’s over, it disbands and everyone goes to their different jobs. When you do the next movie, you don’t necessarily get everyone from the last movie, because the movie’s going to be different. I think this is a metaphor for how you should think about team building in general. But I think the model of that business of the future — when you’re casting a movie. I’ve used this analogy a bunch. It’s in Dream Teams. If you’re casting a movie, you’re going to make some decisions that are different than how we traditionally think of hiring in business. You’re not going to take the 20 actors with the best GPAs from Harvard and put them in the movie. That would be ridiculous. You’re going to take the actors that help you, that, first of all, can get the most out of each other, right? That can have the chemistry and the dynamic and they can push each other and that you can push to mold into the story that you want. You’re going to find the most interesting people. You’re also, if you’re filming moving number two (unless it’s just a repeat of the last movie or unless it’s a continuation of the last movie you were making, a saga, in which case, it’s actually the same project), you’re not going to have all the same cast. You’re going to bring different people in. Even if you’re Wes Anderson and you keep bringing in Bill Murray, he’s playing different roles. He’s not playing the same character and you’re bringing in other people. I think we need to think that way, because you’re solving a new problem. You’re trying to tackle a new mountain peak or whatever. Reassessing who you’re bringing in, who are the right people to be there, who’s going to push each other — that’s super important. We don’t do that very much in the traditional corporate context. It’s easier to do in this in more of an entrepreneurial or a solopreneur kind of context. Then I had another one that was part of that rant, but it’s slipped my mind. I’m sure it will come back. I think very much changing our mindset — we don’t have to do things the way that we did them before. In fact, the way we did them before might be precisely what’s holding us back from doing greater things. Brian Clark:	Yeah, the Hollywood model. I think this is why your book is perfectly timed and needs to be on everyone’s bookshelf. 20 years ago, when I was 30 and very much like you, excited about ideas, excited about writing (I mean, I still am, okay). It’s just weird how you mature in certain ways and yet you remain quintessentially you. But in 1997, Dan Pink, who’s been on the show several times (I’ve known him for 20 years), wrote an article for the very fledgling hip new magazine called Fast Company, which is still around and still going strong. It was called “Free Agent Nation.” Then somehow Dan and I started talking, because I was just so fascinated with that idea. He put forth the idea that teams would assemble and disassemble like in Hollywood. But literally, the time is now and Dream Teams is the book. Not taking anything away from Dan. I guess he was a visionary but way ahead of the curve. It sounds like through the exploration of metaphor, history, like you said, an exploration of human nature as a way to excel at team building, that this is really the book that we need right now. Shane Snow: I appreciate that. I’d hope so. I wanted it to be something that provides an underpinning for how to think about collaboration, whether you’re building a team or part of a team or whether you just are trying to run your own thing. But understanding that you’ll be better if you have a lot of diverse inputs and if you lean on other people to help you be better than yourself. Brian Clark:	Yeah, without social media, the dream that Pink had could not really happen. Now we’ve got some downsides of social media as well. You and I were chatting before we went on the air and I said, “My original model in 2006 was that Hollywood kind of model.” Even that was ahead of its time, because look what happened. I ended up building more. I mean, we were distributed and relied on technology a lot, but we still had 65, 70 employees. Contently did the same thing. It’s easy to say, “Okay, this hasn’t really panned out the way people say,” and yet I think it’s really not either/or. If you are a company that is going to consider an exit of a large magnitude, an IPO, anything like that, then the model Contently is now pursuing makes a lot of sense. The model that Shane Snow is pursuing, I suspect, and I’d like to touch on before I let you go, is a different context and therefore, is much more suited to that model. Now, will we someday get to the point where it’s all this fluid hop-in-project-hop-out? I think so, actually. It just takes longer. It just takes a while for things to change, especially when it comes to corporate business. Shane Snow: Yeah, and there are some things that just big capital intensive projects require some level of assurance that there’s going to be stability and all that. Some industries it will take a while to change, but it’s actually not a huge departure from the way a lot of businesses worked, I guess, pre-industrial revolution or even during the industrial revolution. Brian Clark:	Yeah, people forget that the 20th century changed a ton of the way we think business is done. A lot of things are that way. We have very limited, myopic views of things based on our own lifetimes. But yeah, things were very different. Shane Snow: You would know this better than me, is this story true or is it just apocryphal? That the term freelance came from Knights who were a freelance that you could hire for a raid? Brian Clark:	That is true. That is true. Shane Snow: Yeah, that’s been around for a while. Brian Clark:	Yeah, absolutely. Well, think about it. It’s not like you were going, “Well, what’s your benefit plan for storming the castle?” It’s like you show up, you fight, you get your gold, you move on. Brian Clark:	All right. The new book’s out. It sounds very timely obviously. Talk a little bit about just what’s your path. Obviously, you will continue to evangelize and contribute to Contently as you can, but you’re almost like a freelance in that regard or…? Shane Snow: Yeah, I feel like, I don’t know, like a grandfather or something at this point. Like you can come by and visit and I help and I give maybe not too sage of wisdom. Brian Clark:	Founder at large. That’s the word I was looking for. Shane Snow: Founder at large. That’s what I’m doing. What I’m doing now is I think there are a lot of threads that I’ve explored or that I’ve worked on in my career. There’s very much this investigative journalism in the public interest stuff that I’ve been doing on the side forever, holding the government and powerful people to account. I’m very passionate about that. I have a big role in a nonprofit foundation that we launched that supports that kind of work. I’m doing a lot of writing still on the human behavior of science, exploration stuff as it applies to business and life. The future of media and how media business models work and content marketing and also team building. I think it’ll be a little bit that I’m going to continue to explore and create and write. I actually have ambitions to write for some newer to me medium. I like television and that sort of thing. But I do think at some point, I want to tie some of these threads together, and like a lot of entrepreneurs, build the next thing. Something more ambitious, where I take the things that I learned, good and bad from the last few stints, and create something in a new way. And I think very much the team building model will be based on all this stuff that we’ve been talking about. I think also, I’ve been thinking about…I’m in my mid-30’s now and just seeing the world and life a little bit differently. I’m sort of building this Venn diagram of next big projects that I’m going to devote some time to. I know it’s going to be at least a decade’s worth of work, because it turns out that that’s what happens when you start a company that’s ambitious at all. But I want to build something that…one of the circles of the Venn diagram is “It doesn’t need me as the linchpin after not too long,” which I think is every entrepreneur’s goal at some level. Another piece of the Venn diagram is, “Has a big impact in a positive way on communities and society.” And then the other one will be something to do with media and business and all that. So I’m noodling on those kinds of things and I think I’m planning on taking these passions and these kind of criteria and the requirements or whatever and exploring some different things that I can do it. In the meantime, I plan on writing about a lot of weird and strange and random things, and doing more exploring so that I can do that thing we were talking about, where creativity is connecting dots that haven’t been connected before. I plan to build my database in my brain, fill it with some new and disparate things, so that I have more in there to make connections when I work on the next big thing. Brian Clark:	Well, I strongly suspect you will do that next big thing and I’m looking forward to seeing it happen. Brian Clark:	Shane, thanks so much for your time. The book is called Dream Teams: Working Together Without Falling Apart. I strongly recommend it. Again, even if you want to stay solo, it’s almost more important that you effectively use people resources in a way that allows you to do bigger things in yourself. Brian Clark:	I think Shane would agree with that very lofty ambition. All right, everyone, thanks for tuning in. Thanks as always and keep going.